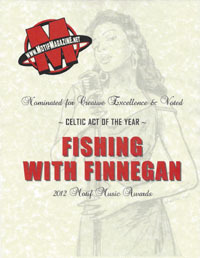 After four years of nominations, we're so very excited to tell everybody that we took home the Motif for Best Celtic Act last night! We're truly honored to have been nominated; it blows our collective mind that we've been placed in the same bracket as the other nominees. Winning was just the icing on the cake! Thank you to everyone who voted for us or has supported us in some other way. Coming to the inevitable conclusion that every decent band needs a good montage, we bring you this.